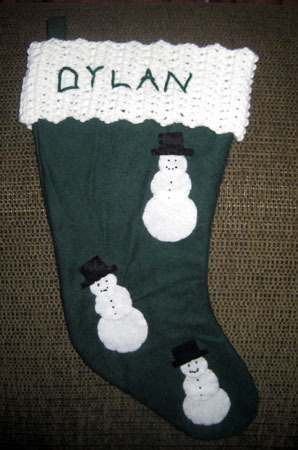 I made two more stockings this year, one for my friend Amy and one for baby Dylan who joined the Rust family this past spring. 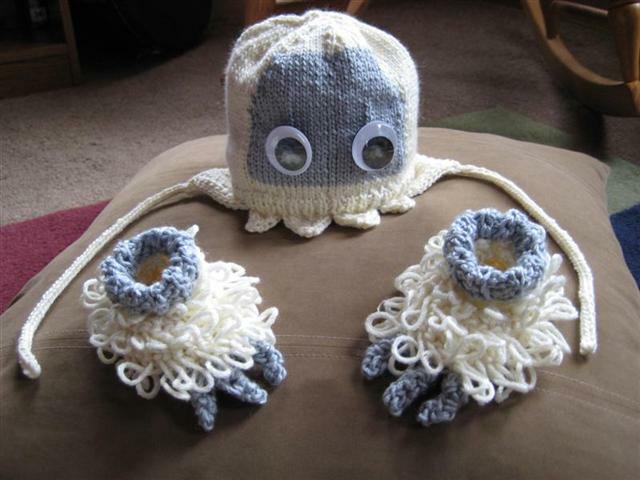 I made the Abominable Snow Baby Hat and Booties for Heather’s baby shower. 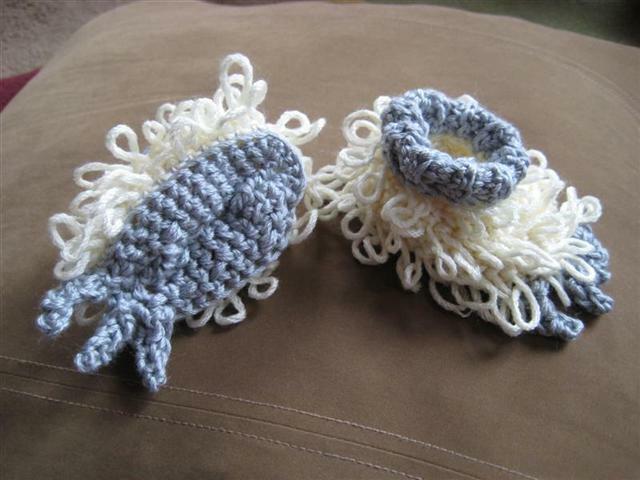 The hat was knit on US 4 needles and the booties were crocheted with a size H hook with NaturallyCaron.com Country 75% microdenier acrylic / 25% merino wool in Naturally (0007) and Silver Service (0008). 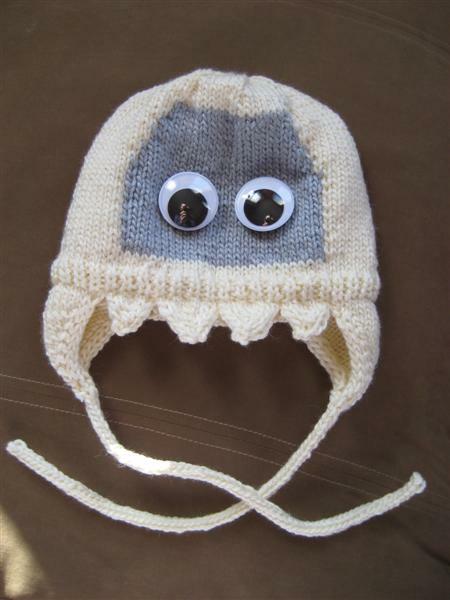 I made the Alsace Le Monstre Doll and Hat for Heather’s baby shower. They were knit on US 4 needles with NaturallyCaron.com Country 75% microdenier acrylic / 25% merino wool in Deep Purple (0014), Foliage (0012), Naturally (0007), and Black (0024). 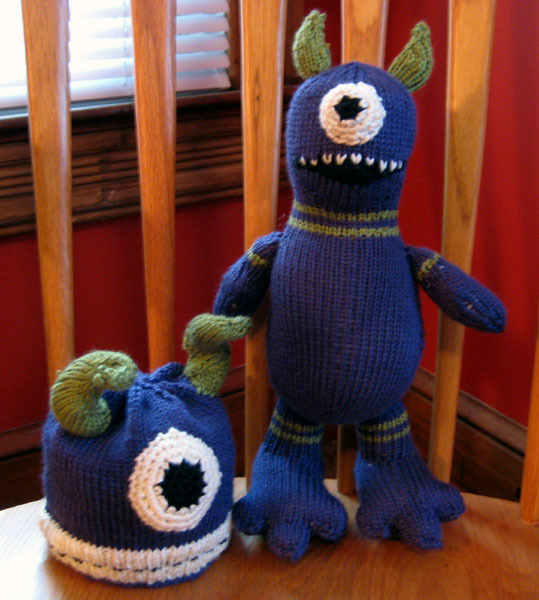 The eyes were crocheted on a size E hook. 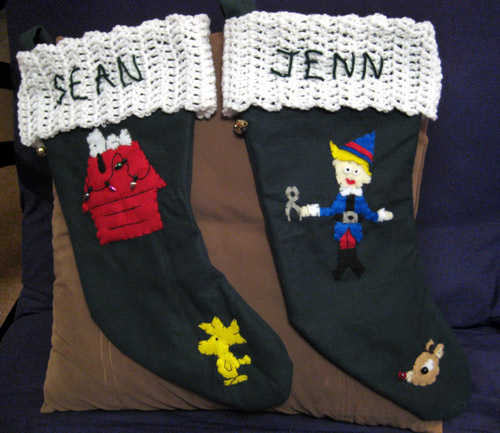 I made these for Sean and Jenn out at their new home in Oregon. 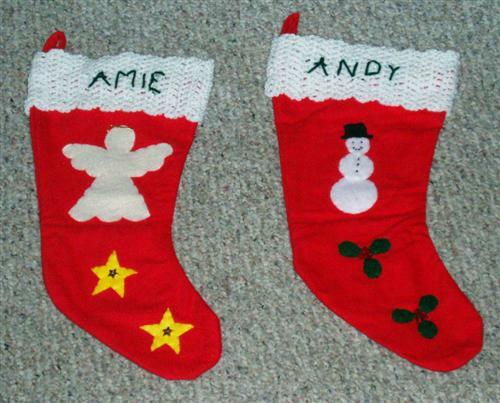 I made these stockings for Amie and Andy based on stockings that my mother made, which were based on stockings her grandmother made. They are just flannel, felt, and Red Heart yarn. 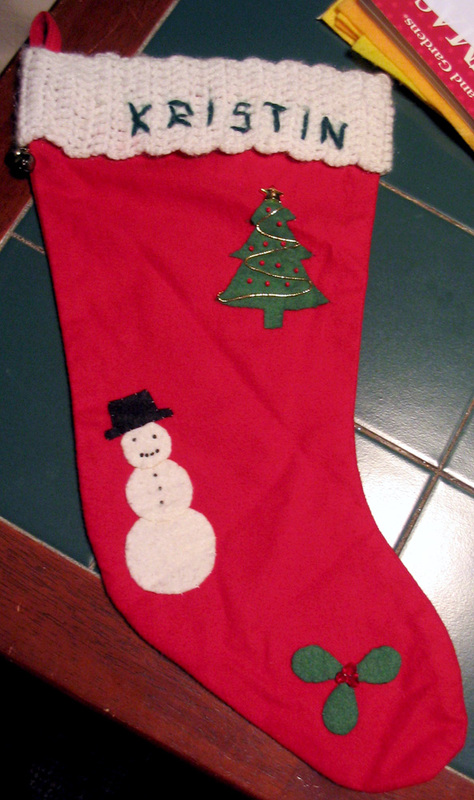 My aunt stayed with us for Christmas this year so I made her this stocking based on stockings that my mother made, which were based on stockings her grandmother made. It’s just flannel, felt, and Red Heart yarn. The pattern matches the pattern that my mom, myself and my little sisters have. 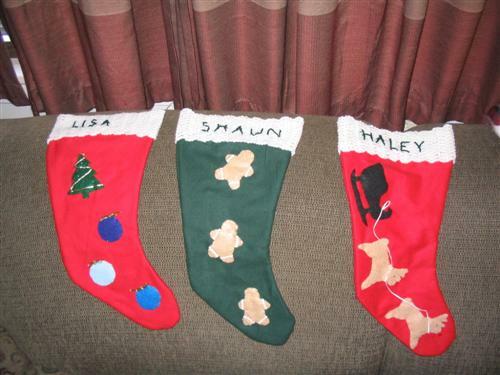 I made these stockings for Lisa, Shaun and Haley based on stockings that my mother made, which were based on stockings her grandmother made. They are just flannel, felt, and Red Heart yarn. Lisa and Shaun’s Haley was born this morning so I rushed to finish the blanket I had started and bring it with me to the hospital. 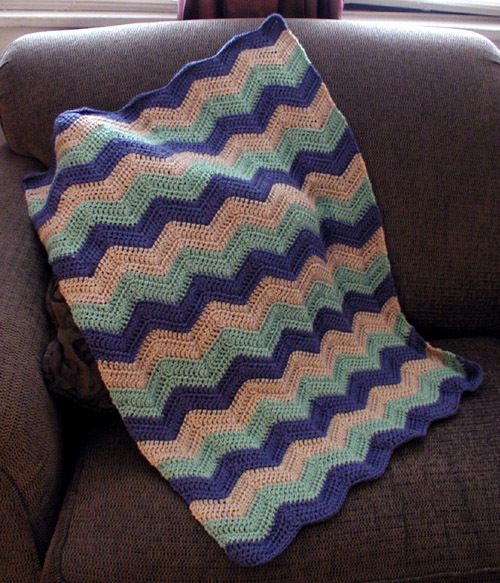 I followed the Easy Ripple Afghan pattern. 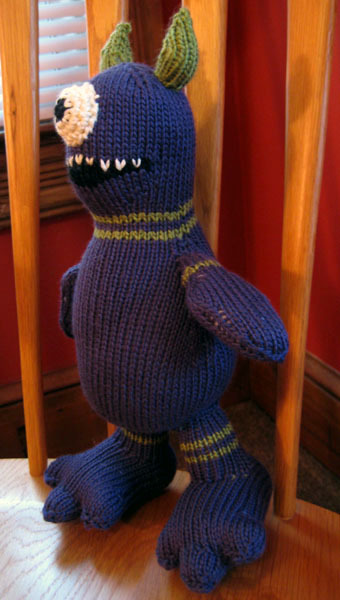 The yarn is Caron Simply Soft 100% acrylic in Country Blue (9710), Bone (9703), and Sage (9705). 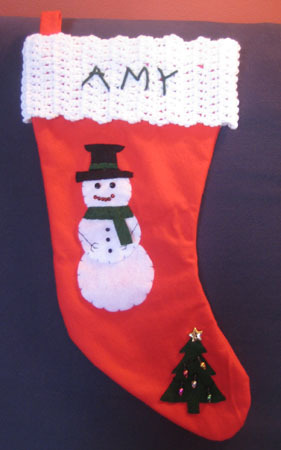 I used a size H-8 crochet hook. 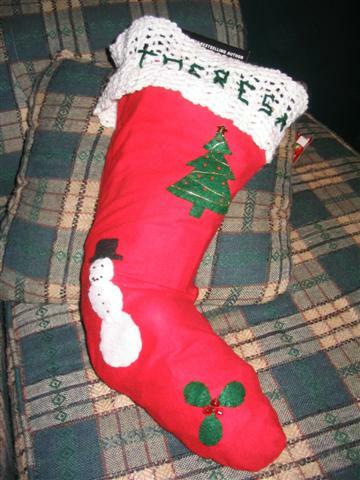 I chained 98 stitches to start and got a finished size of about 26″ by 36″. 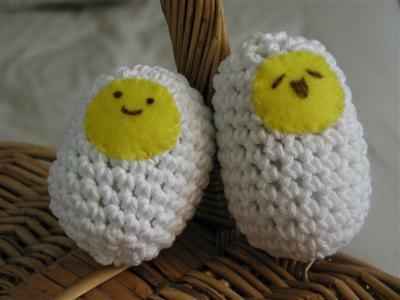 I made these out of Lily Sugar ‘n Cream 100% cotton in White (00001) with a size G hook. The faces are just yellow felt and black permanent marker. 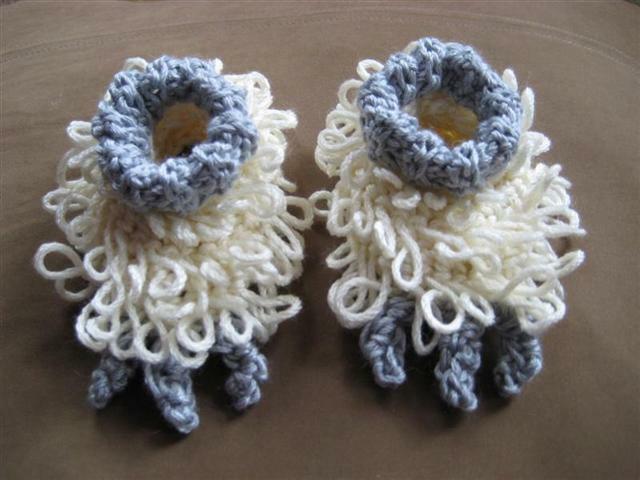 They are for two little girls who love the Egg Song. I made String Bag for myself. 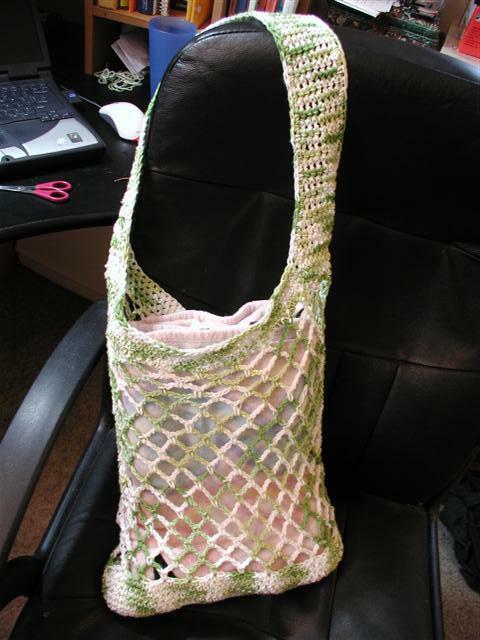 The yarn is Lily Sugar ‘n Cream 100% cotton in Key Lime Pie (02713). I used a size G hook. The only modification I made was to change the handle’s position to the sides of the bag. 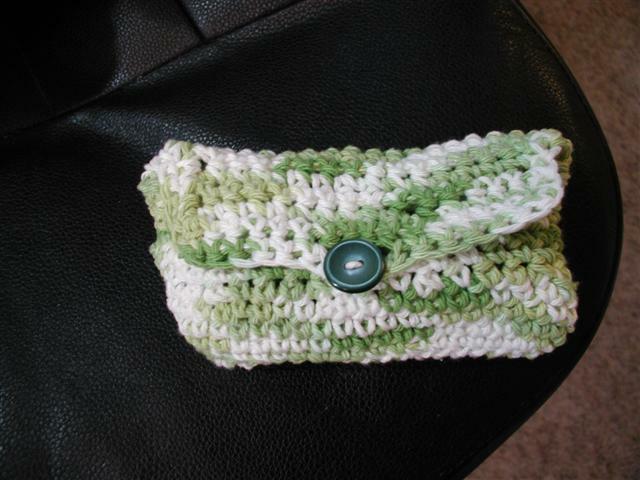 Since I had extra yarn I decided to make a sunglasses case in the same style as the handle.